ChiIL out with ChiIL Mama and win a Blu-ray Combo Pack of The Hobbit: An Unexpected Journey! We caught this film in the theatres and loved it. Now you can own it to watch at will. 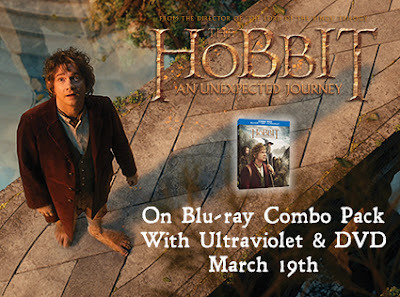 Add a little middle earth magic to your collection with this Blu-Ray, Ultraviolet & DVD set. • Post your results from the Are You 100% Hobbit Quiz! • Share your favorite Hobbit Handbook activity! • Get Social! Tweet with the #TheHobbit hashtag to get your audience excited about the premiere of The Hobbit: An Unexpected Journey coming to Blu-ray & DVD March 19th 2013! Disclosure: ChiIL Mama thanks Warner Bros. and Partners Hub for providing the Blu-ray for this giveaway in promotion of Warner Bros. release of The Hobbit: An Unexpected Journey Blu-Ray & Blog App. All opinions are our own. Awesome film. Watch it several times. Wow! I'm 83% Hobbit-kind of surprising!! I like the build your own hobbit hole activity. The hobbit hole activity was cool. I'm only 17% Hobbit, but that's because I'm mostly elf! I'm only 17% hobbit, but that's because I am mostly elf!